Already our early ancestors liked pretty semi-precious stones giving the most prominent mineral names here are data about gemstones such as rubies sapphires emeralds and how they are mined cut faceted and polished in a fascinating technological process or often just collected in the old fashion way. 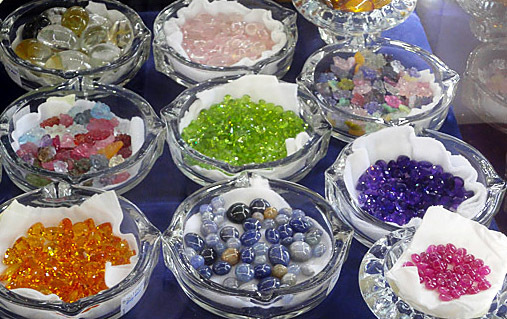 Here are newest information on gemstone colors and shopping. Most precious stones are of an inorganic material with a particular chemical composition and an internal crystal structure. A few of them such as pearls and amber are from plants and animals origin they are known as organic gems. 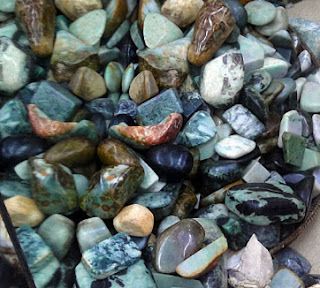 Other gemstones such as Lapiz Lazuli Turquoise and azurite plus copper-rich stones blend with water. Malachite emeralds and tourmaline are made when water get in touch with magma and then crystallize spaces are broken up are filled with veins of other minerals and form hydro-thermal deposits. In the last hundred years, artificial stones were created in labs which are physically the same as the natural ones often even better because much clearer but people like it made by mother nature. Normally all minerals are originated from natural processes without any direct activity or interference of man. With modern technology today physical and chemical properties similar to mineral are made but because it is man-made it cannot be called natural. Nowadays however synthetic stones are produced commercially on a large scale for use in industry and jewelry but these are not classified as naturally. Many minerals are found in association with each other and it is very likely that some of them originated side by side in the same or very similar environmental conditions. Such a mineral assemblage is called a paragenesis (from the Greek pare = alongside and genesis = origin). 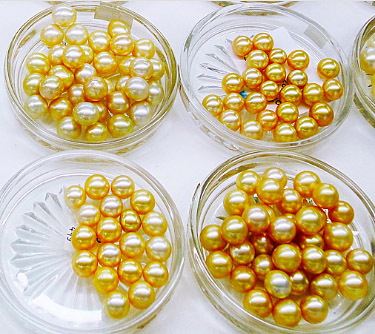 Here are the most beautiful natural cultured south sea pearls with many colors including pink and golden. Perhaps as much as 2.5 million years ago people began collecting stones of special size shape texture and hardness for use as tools. At first, the stones were used unshaped then gradually they were fashioned with other stones into a variety of complex forms and used for specific tasks. 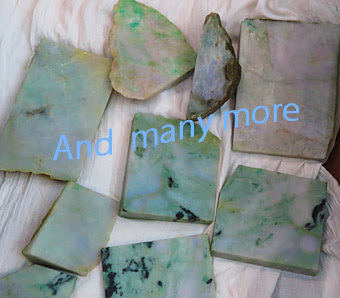 One of the most prominent are Jade-Stones. This practice of collecting and shaping of stones for use as tools continued for hundreds of thousands of years even until modern times in some remote parts of the world where people continue to have a hunting and gathering way of life. Usually the only traces of Stone Age people remaining today are the stone tools left behind in caves at riversides and other camp sites. By studying this places archaeologists can understand how human cultures have evolved since our early ancestors first started utilizing semi-precious stone as a raw material. In archaeological terms it was only very recently in human evolution about ten thousand years ago that prehistoric people began to give up their nomadic life and to settle first in small and then large communities. They found gold, silver, copper, and tin, which they shaped into ornaments and utensils. Later, people discovered how to alloy copper and tin into bronze and to smelt iron. 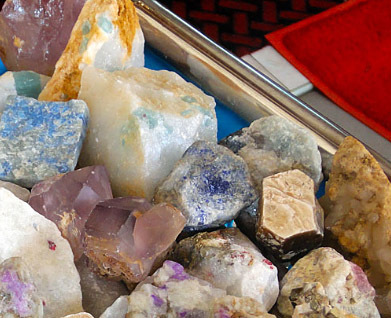 Gem minerals, like the precious metals, would have been first found by chance. Stones for Novelties & Fashion Jewelry. Fine ornaments and cult objects were made from the less precious metals such as copper and its alloy bronze these were often together with attractive pieces of semi-precious stones. Babylonian and Assyrian scrolls) were being made in Mesopotamia as long ago as the fourth and third millennia BC. Semi-precious stones were being used in gold jewelry by the Minoans, Mycenaean's and the Egyptians in the second millennium BC. Later, gemstone-working in the Mediterranean region became widespread, probably as a result of the eastern campaigns of Alexander the Great. 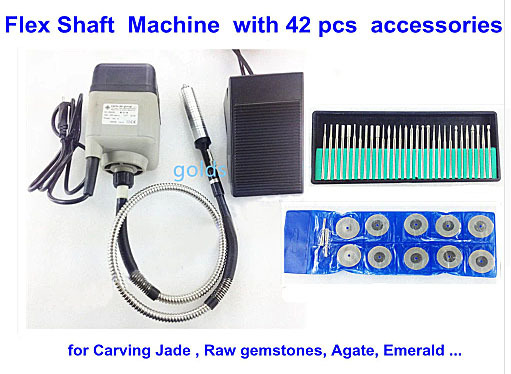 Gem engraving or glyptography is shown below. Gemstones reached ancient Greece from the Orient. Gemstones reached ancient Greece from the Orient first mainly used in the making of furniture inlaid. During the late Roman, Empire gems were being used not only for the adornment of the Emperor's robes but also to decorate harnesses, chariots, and utensils in the Imperial Household. The most prized gemstones of the period were agate amethyst beryl chalcedony amber jasper rock crystal opal ruby emerald and coral. The gemological knowledge of the Romans was relatively advanced. The great Roman naturalist and writer Gaius Plinius Secundus (AD 23-79), known to English-speakers as Pliny the Elder, wrote a work of 37 volumes called Historia Naturals that covered the entire knowledge of nature, including rocks and minerals. If the Renaissance period raised the status of gems, the Baroque devalued them, but not through any lack of interest. Quite to the contrary, what happened was that during the Baroque period the taste for rich ornamentation and lavish decoration led to the use of glass imitations rather than genuine gemstones. New decorative compositions were devised that utilized conspicuous pastel shades made possible by glass imitations of agents. Interest in genuine precious stones was almost entirely confined to diamond, emerald, sapphire, rock crystal and ruby. Semi-Precious Stones History got a major change after the french revolution gave birth to a new social class that brought a change in taste. The demand was not for splendidly luxurious, showy gems but more for personal jewelry that could be worn every day. The jewelry assortment grew and interest has remained relatively stable throughout the 19th and 20th centuries. The synthetic production of gemstones has affected the price of some natural stones but it has never depreciated the value of the natural diamond, ruby, emerald, and sapphire. Synthetic stones may have reached an astonishing degree of perfection that often surpasses even that of the genuine article, but most people still prefer jewelry made with natural gemstones. 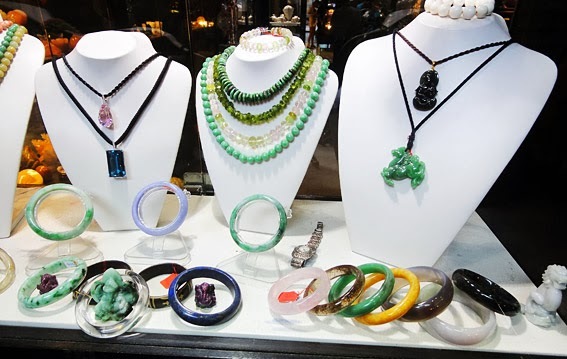 At one time, gemstones were classified into three groups: precious stones, semi-precious stones, and decorative stones. However, this system of classification based on a complex value a combination of rarity properties, and beauty and used mainly by the trade has never been satisfactory because the lines between the individual categories were often meaningless. Moreover, some experts limited the term 'precious' to diamond ruby sapphire and combined of them corundum and emerald. Because of this lack of precision in terminology, gemologists have abandoned the former classification and they now describe any stone as having gem quality if it has beauty (so that it delights the eye), rarity (so that it is unlikely that one's neighbors own one like it!) and durability (so that its beauty will last 'unto the third generation'). 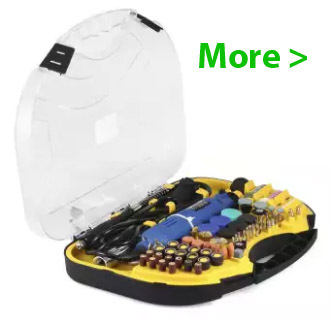 A gem must, of course, also be portable if it is used for personal wear. Note that the term `gem' covers cut stones as well as rough crystals and fragments of gemstone material. The term 'jewel' or 'jewelry stone' is more explicit and limited in its meaning because it designates a fashioned (cut) and/or polished stone prepared for setting in a precious or a common metal, or already set in a jewel. There are certain exceptions to the rule, for example, moldavite is used today in its rough, unworked form in jewelry. As we have just seen, the possession of beauty is one of the criteria used to classify a mineral in the noble society of gemstones. But how do we measure beauty? Most people would agree that an attractive stone is one that possesses a high degree of brilliance and refraction of light, an attractive color and transparency or translucency. Take, for example, the red ruby, the blue sapphire, and the green emerald: they are all transparent, highly brilliant and attractively colored. However, a gemstone need not be colored for it to be attractive. For example diamond is usually colorless but it more than compensates for this by its beautiful 'fire' or plays on the cut edges of the facets (caused by a high refraction and dispersion of light), brilliance and transparency. One attractive property is sufficient to rank a mineral among gemstones; for example, turquoise is not brilliant or transparent but it has a beautiful azure-blue hue. Instead, the sensation of white is created by equal amounts of all the wavelengths of coloured light, from 400 to 700 nm, striking the eye. Black is simply a lack of any visible light reaching the eye. An object appears colored because of its selective absorption of visible light. This is the manner by which it absorbs some wavelengths, or colors, while freely transmitting '.or reflecting others. The actual colour we see depends on our eyes' interaction with the wavelengths which strike the eye and is often the complementary colour of the light absorbed. In the simplest terms, grass appears green because, when white light falls upon it, all colours are absorbed except green. Absorbed, a green sensation is produced when they strike the eye together. If the grass was illuminated with a red light, it would appear black because the red lights absorbed by it; thus, no visible light reaches the eye. To someone who is blind, the grass would appear red when illuminated by white light because of a lad of green-sensitive optical components, or cones, in the eye. From these examples we can see that the grass appears green not just because of the way it absorbs light, but also because of the physiology of our eyes and, of equal importance, the spectral composition of the light source by which it is illuminated. With this in mind we will now look at specific situations in corundum. Crystal habits:............................................................................. Hexagonal bipyramid, tabular hexagonal prism. Which means 7 or more on the Mohs' scale are ranked among precious stones softer minerals are classified as semi-precious. lose their brilliance and color. Rarity is the another important property a mineral must have if it is to be classified as a gemstone. However, fashion may play a big part in this respect. Bohemian garnets were any popular at one time, then they dropped out of fashion. Only diamond (hardness 10) ruby sapphire plus emerald have never been threatened by the fluctuations of vogue. Some gemstones enjoy a considerable popularity in the countries where they are found, for example, the pink margarine or rubellite in France, alexandrite, malachite and rhodonite in the Soviet Union, and the pink kunzite and the green hiddenite in the United States. Although a gemstone may be fashionable for a time because of its color, certain rules should be observed with regard to wearing.Sometimes this can be studied directly by observation of such natural processes as volcanic activity and smoldering coal heaps.The cut gemstone must retain its beauty, especially its brilliance and transparency, even when set in a jewel and worn. The greatest danger to gems comes from mechanical damage and sometimes also certain chemical agents. A gemstone must, therefore, be as resistant as possible. Great emphasis is thus laid on hardness, formerly the main factor in the classification of stones into precious and semi precious Y s categories. Transparent stones with bright hues often suit women better than men and, as a corollary, stones with deeper hues of less conspicuous shades may suit men better than women. Jewelry must, of course, match one's clothes and be appropriate for the occasion. For instance, formal evening clothes for a theater or a concert do not go with brightly colored stones that loudly manifest their presence from afar. Similarly, a ring with a round stone will probably look wrong worn on a long slender finger. No jewel should be worn permanently. No jewel should be worn permanently because it loses its appeal in time, and it goes without saying that nothing should be worn if it is a hazard at work. If several jewels are worn together, they should match. Gems showed on the necklaces and rings of the ancient Egyptians with the same intensity as they did on the hands and necks of the ancient Greeks. Homer wrote of the precious, priceless earrings of Hera and of the amber necklace that Eurymachos gave to Penelope. For thousands of years, people have treasured gems. Is this only because gems are beautiful or does vanity lie behind it? Whatever the reason, since time immemorial mankind has loved beautiful things and it is no wonder that we have always been under the magic spell of gems. Minerals also separate from hot-water springs and they form in the bottom muds of lakes and in mines and quarries. Mineralogists also gain useful information about mineral formation by studying the products of metallurgical and glass-making processes and chemical compounds synthesized in the laboratory. If a mineral is formed in association with certain other minerals during, say, a volcanic process, we can then reason that the minerals originated in the same or similar conditions in the geological past. Some minerals have retained their appearance since the time they were first formed. A larger group of minerals, secondary minerals, formed on the Earth's surface as the result of the transformation of the primary species. Minerals that develop deep in the Earth's crust in conditions of high pressure and temperature may be poorly suited for the conditions that prevail on the surface. So when such minerals are brought to the surface by geological processes and exposed to the effects of the atmosphere plus water and aqueous solutions, they are gradually changed into other minerals that can withstand the surface conditions better. For example, limonite (iron hydroxide) is the rusty-colored weathering product of iron-containing minerals such as pyrite, and the green malachite and blue azurite are formed in zones of weathering or oxidation in copper ore deposits. Secondary minerals usually contain the water molecule H2O, hydrated compounds or the hydroxyl ion OH hydrous compounds. Other minerals that are resistant to weathering at the Earth's surface may be eroded out of existing rocks and deposited in sediments. Semi-Precious Stones contain traces of other element. This are inclusions or liquids and gases or ingrowths of crystals of other minerals. This inhomogeneity changes the mineral's chemical composition and to a certain extent affect some of its physical properties, such as specific gravity, hardness, color, and transparency. The foreign inclusions may, however, help to distinguish a natural stone from an imitation or a synthetic product, and because some inclusions are characteristic of certain geological conditions, they may also help to determine the origin and locality of the mineral, a generalized chemical fontina is usually given to each mineral compound. Sometimes one element in the compound is replaced by another element with the same parameter and of similar size without changing the external crystal form of the mineral. This is called isomorphism. For example, in the olivine group the forsterite molecule Mg.2[SiO4] is replaced by the fayalite molecule Fe2[SiO4]; and in the garnet group pyrope molecule Mg3.Al2[SiO4]:, is replaced by the almandine molecule Fe3Al2[SiO4], Isomorphism is also common in such mineral groups are tourmalines, plagioclase feldspars, and pyroxenes. The characteristic isomorphism explains the range in composition and variation in properties in these mineral groups. There are about 3,000 described minerals and their varied chemical compositions include almost all the known chemical elements. About 80 of these minerals in one form or another have the necessary qualities to make them suitable for use as gemstones. Strange though it may seem, some of these gem minerals are also the principal constituents of the that make up the Earth's crust. Varieties of quartz, feldspar, and olivine, for example, are fashioned into gems; yet these same minerals are also among the 40-50 common rock-forming minerals. Rocks are usually mixtures (aggregates) of several different minerals. For example, quartz and feldspar, together with mica, make up the well-known rock known as granite. These mineral constituents occur in varying proportions in different granites and even in different parts of the same granite mass, rocks are nonuniform or heterogeneous, they do not have a definite chemical composition or structure. Exceptionally a rock will consist of only one mineral, an example being pure marble which is made up of calcite. In contrast to rocks, minerals are uniform or homogeneous substances; that is, they have a characteristic chemical composition and definite internal atomic arrangement (structure) which may be expressed in typical outward forms called crysms. The Minerals / Gemstones are made from. 1. Elements Diamond, gold, platinum, silver. 2.Sulphides (also selenides, tellurides, arsenides and antimonides) Marcasite, pyrite, sphalerite. 4. Oxides (also niobates,tantalates and titanates) Agate, cassiterite, chalcedony, chrysoberyl, chrysocolla, corundum, cuprite, haematite, jasper, opal, quartz, rutile, spinel. 5. Carbonates (also nitrates and borates) Aragonite, azurite, calcite, malachite,rhodo-chrosite, smithsonite. 6.Sulphates (also chromates, molybdates and wolframates) Gypsum . 8. Silicates Agalmatolite, andalusite, axinite, benitoite, chrysocolla, charoite, cordierite, danburite, dumortierite, euclase, feldspar, garnet, jadeite, kornerupine, kyanite, lazurite, lepidolite, natrolite, nephrite, olivine, phenakite, prehnite, rhodonite, sepiolite, serpentine, sillimanite, spodumene, staurolite, thomsonite, titanite, topaz, tourmaline, vesuvianite, zircon, zoisite. 9. Organic compounds Amber, coral, jet andcannel, pearl Not only do the members of each of these groups have similar chemical composition. Processes to the formation of minerals and rocks. The consolidation of hot molten silicate material or magma within the Earth's crust led to the class of igneous rocks. Magmatic processes which take place at temperatures of between 650 and 1200 degree centigrade cannot, of course, be observed directly, but some idea of them can be obtained by study of active volcanoes and of the final p elements. Oxides too are generally hard and resistant to severe both carbonates and phosphates tend to be soft and easily damaged by acids or alkaline and organic compounds. A good example is amber are attacked by hydrocarbon-based solvents and detergents. 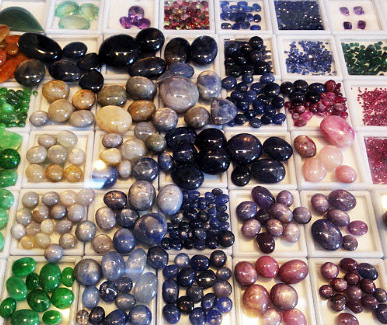 A thorough knowledge of the chemical composition of gemstones is thus very important in the gem trade. There is also a resistance of individual gemstones to chemicals and high temperatures. Some gems do not belong to the mineral kingdom even though they are usually sold as precious stones. For example, serpentines and some marbles are metamorphosed rocks; obsidian is a type of volcanic glass; tektite is a natural glass which formed by the melting of rocks on the Earth's crust at the point of impact of a large meteorite are coal substances; pearls are the products of certain mollusks; coral is mainly an animal skeleton; and ivory is obtained from elephant tusks. As we talk about gemstones not minerals as a whole the crystal chemical classification that has just been outlined is not the most suitable for use in a guide of this sort. Therefore, in the main pictorial part of the hook, the gemstones are arranged in a special order devised by gemologists just for jewelry stones. Gemstones are not a uniform group of minerals related by similar chemical compositions and properties some are oxides others are silicates carbonates phosphates and so on. 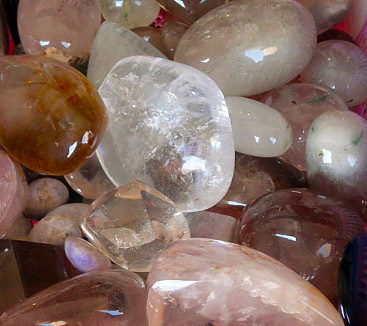 Neither do all gemstones form in the same way nor do they occur in the same rocks. Sometimes a mineral has a common variety that occurs widely and a much rarer gemstone variety that is found only in certain unique localities where special circumstances led to its formation. Beautiful Myanmar Jadeite Jade. For example, the common olivine is the principal component of rock called peridotite and it constitutes a quarter of all basalt rocks, but its gem variety peridot (chrysolite), is very rare. Many semi-precious stones such as turquoise and azurite copper-rich stones have amazing properties among other they blend with water. Malachite emeralds and tourmaline are made when water get in touch with magma and then crystallize. Spaces are broken up, are filled with veins of other minerals and form hydro-thermal deposits. Quartz too is a very common mineral in the Earth's crust. But fine gem-quality crystals occur only rarely. Some varieties of diamond are much rarer than others.